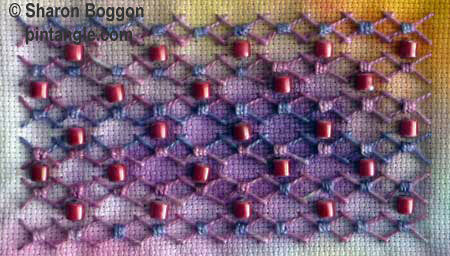 Fancy Hem Stitch is a simple quick stitch which I think people will enjoy. Crazy quilters I am sure will see immediately how useful it can be. Embroiderers will enjoy it not only in use on edgings but also work row upon row as a filling stitch. I first discovered this stitch in a Batsford book called Embroidery Stitches by Anne Butler. The foundation rows are the same hand movement as large stem stitches which are loosely worked and then laced. 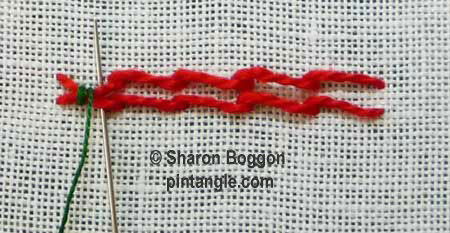 Fancy hem stitch really comes into its own when you experiment and change threads. It looks great in a thread with a firm twist or a fine braid or even a ribbon. Beads also can be added for extra zest. 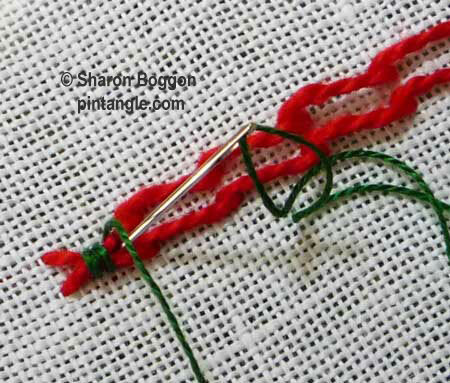 Work the foundation stitches in a loose manner because when they are laced they pull tight. If keeping your tension even is a problem use an embroidery hoop. The first row is worked from left to right. Bring your needle from the back of the fabric. 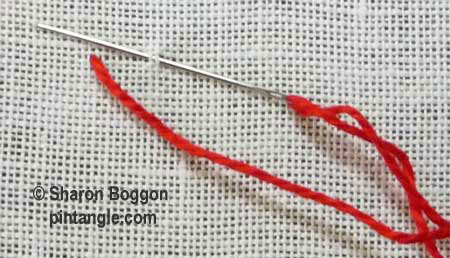 Make a long stitch, point the needle into the fabric, and bring it out a little along the line to make a small back stitch as illustrated. 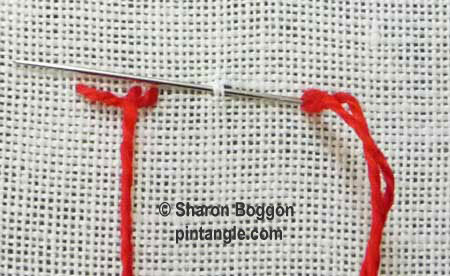 Take the needle through to create the first stitch. Pull the thread through the fabric. 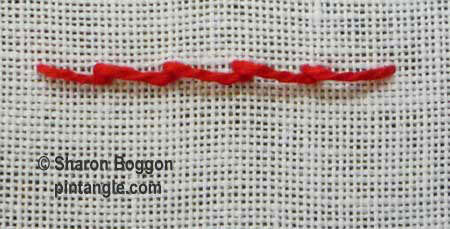 Make the second long stitch forward, along the line. 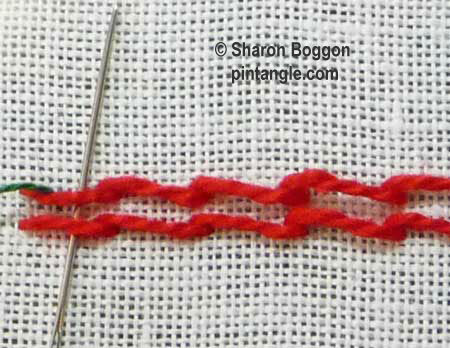 Keep the thread to the same side of the needle with each stitch while you repeat this back and forth movement along the line. At the end of the line take your needle through the fabric. Turn your work. Work the second line of stitches. You should have two lines of loose stitches. From this stage on you are not taking the thread through the fabric when you are wrapping the stitches. 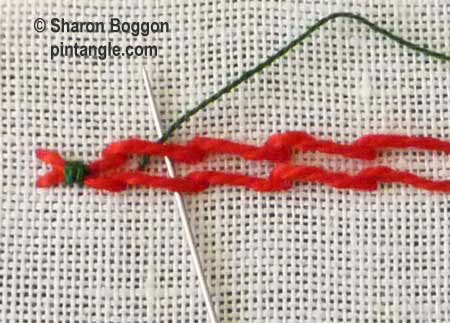 Wrap the two stitches together with 3 wraps of the loops as illustrated. 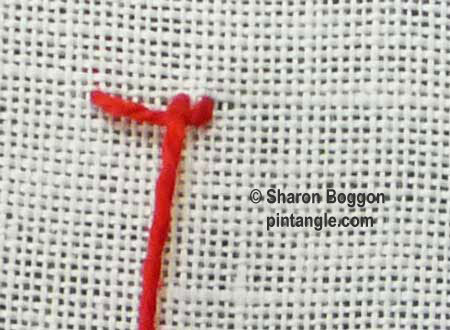 Take your thread to the back and bring the needle up through the fabric at the next loop, in between the two lines of stitching as illustrated. Repeat this wrapping process until you have reached the end of the line. Thank you Sharon for adding this wonderful stitch to the collection. I liked this one a lot! Thanks Sharon, this is a cool stitch. I will definitely continue using it! My sample is accompanied by a lot of friends I just couldn’t resist!